So where’s the one-off prototype been all these years? 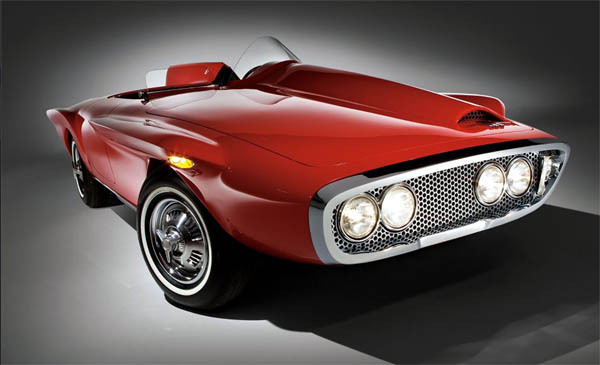 After Chrysler execs vetoed production of the XNR, it was sent back to Italian coachbuilder Ghia, which originally assembled the car. From there, it changed hands between several notable foreign collectors before finally being turned over to RM Restoration in Paris in 2008. The car was fully restored in March, 2011, and was displayed for the first time in the U.S. since the 1960s at last year’s Amelia Island Concours d’Elegance. Now, the car will go to the highest bidder when it crosses the auction block at RM’s Monterey sale on August 17-18. No auction estimate has been assigned to the XNR, but considering its one-off status and sharp, jet-age styling, we’d guess it’s for high-rollers only.